Apart from environmental protection (atmosphere, hydrosphere and biosphere) there are fundamental social needs for safety and security of humans, in particular on community, organizational/labour and national levels. Solid protection instruments what regards the environment, and the safety and security of humans are imperative for achieving national and regional sustainable socio-economic developments. A system of drones has been developed to help quick rehabilitation of Earth’s lungs, forest trees. The system is supposed to help plant almost 100,000 trees per day. The Earth is rapidly losing its forests at a rate much faster than humans can manage to replant with the same speed. How much is the degradation of world forest is, is not really known and figures vary. According to Scientific American “most analysts show up to 15 percent [of global carbon emissions] is due to deforestation.” This means that by clearing or burning the Earth’s forests, we are directly contributing to huge increase in climate change rates. One Australian engineer is enlisting technology to fight the battle against the ongoing deforestation. Dr. Susan Graham has helped to develop a pair of drones that can slow down some of such damage by planting trees at a rate that far outpaces what is possible to do by hand. 3R-Culture for Saving Planet Earth from Waste and Pollution. The 3R-culture “Reduce, Reuse, Recycle” is establishing itself with key concepts in the ever expanding ideology and awareness of the fight against the accelerating pile-up of waste and pollution. Waste and pollution is not only a threat for endangering the whole life on planet Earth but it is also one of the main core reasons for global contrains and malfunctioning in industry and technology. Furthermore, it has also huge impacts on micro socio-economic developments and stability of rural and coastal environments in particular the livelihood of the poor and local communities that are dependent on the natural resources of their land-water systems. These multi-layered and multi-scale threats taking place in the Anthropocene and are caused by an ever expanding cycles of “production-consumption-waste” with increasing rates that we have not seen its peak yet, the “Peak Waste” (https://www.slideshare.net/mobile/ReciclajeInclusivo/esquemas-inclusivos-de-responsabilidad-extendida-del-productor-aprendizajes-desafos-y-oportunidades-por-derek-stephenson, http://www.smithsonianmag.com/science-nature/when-will-we-hit-peak-garbage-7074398/, http://environment-review.yale.edu/tags/industrial-ecology-urban-planning). In low income countries with increaing transformation towards industrialisation and urbanization but yet with poor public infrastructures and almost non-existing policies for environmental protection and preservation, waste and pollution threats are enormous. However, a new 3R-culture is emerging from grassroot rural communities to save their livelihood which, unlike big national/international industries and production/urban facilities, is very much dependent on their living land-water resources where they live, work and develop roots that can last for decades or even generations. In the photo is the WORLD’S FIRST: THE PLASTIC-ONLY BOAT TO FIGHT POLLUTION that was created by the people of Kenya of the East Coast of Africa. This dohow in over 30 tonnes of recycled plastic waste, a waste which is indeed Kenya has lots of it. Such waste became the raw materials making a 60-foot dhow that is set to sail from the Kenyan coast to South Africa, in an initiative meant to raise awareness on the growing menace of plastics to marine ecosystem and spur a plastic revolution. More about the SDG Junior Ambassador Programme: Adopted by the United Nations (UN) in 2015, the SDGs is a universal call to end poverty, protect the planet and ensure all people enjoy peace and prosperity. The SDG Junior Ambassador Programme will cultivate the mind-set of primary schools students on environment conservation and sustainability. It will also foster a deeper connection between students and global policies, so as to drive a Behavioural Change from Inception to Implementation towards educating the community to create a greener lifestyle. The increasing pressures and competition on water resources on different spatio-temporal scales require developing more friendly and sustainable approaches to meet the increasing constrains from population growth, uncertain energy production and accelerating threats from global warming. Among newly emerging solutions is Grid-concept “water production-distribution-consumption” which is described in the attached Link that describes “Sustainable Water Distribution Strategy with Smart Water Grid” (http://www.mdpi.com/2071-1050/7/4/4240/htm). Sustain-Earth.Com supports all active efforts and challenges to promote and implement the Paris Agreement and the UN SDGs. Does the Nobel Prize Support Sustainable Developments on Planet Earth? If, Yes How & If No Why? With the ongoing efforts to promote and implement the UN-SDGs including the EU vote to ratify the Paris Agreement (http://bit.ly/2dpyVoa) there are emerging key strategic issues. Countries around the world are called upon to act quickly to fulfill all the promises for the protection and preservation of the Earth’s natural resources. All society sectors (private and public), knowledge disciplines and human activities on planet Earth, both vertically and horizontally, have direct responsibilities in the ongoing process of transformation. There should be tools and instruments to assess the role and involvements on several levels, i.e. through coordinated webs of Key Performance Indicators. Among such instruments is the Nobel Prize which indeed played, and still playing, important role in promoting essential knowledge disciplines. However, knowledge in itself has to be promptly and effectively utilized by all sectors and on all levels to promote and implement the Paris agreement through effective coupling of diverse and wide spectra of knowledge to society, population and the market needs. It is interesting to see how far the Nobel Prize contributed in the past in developing the UN-SDGs, and also how much it will contribute in promoting and implementing these goals in future. By founding the Nobel Prize in 1901 Alfred Nobel made the name Nobel famous worldwide. But Alfred’s prize was not the first Nobel Prize. As early as 1889 the Ludvig Nobel Award was founded. Ludvig was Alfred Nobel’s older brother and worked as a scientist, inventor and businessman in Russia during the second half of the 19th century. Alfred was most likely inspired by his brother Ludvig when founding his Nobel Prize, one of the most prestigious scientific awards of all times. Ludvig and his other bother, Robert Nobel, had an oil company in Baku, a manufacturing site for diesel engines in St. Petersburg and many other industrial sites throughout Russia during the late 19th century. Ludvig, however, strived to improve the conditions for the workers at the industrial sites by the introduction of shorter working hours, schools, healthcare, recreational facilities and also cooperative banking system for the employees. This was the 1st global initiative towards the implementation of Applied Sustainability but still lacked the environmental issues. In this context Sustainability and Social commitment was the trademark of the Nobel industries as visioned by Ludvig and Robert Nobel. The Russian revolution in 1917 changed the scene dramatically. Ludvig Nobel’s prize in science and research never became much more than a dream due to the revolution. Thanks to the global trends of human thinking and the recognition of R&D as an integrated part in socio-economic developments, i.e. in the framework of the UN-SDGs, today the efforts of Ludvig Nobel and his brother have not been forgotten specially in Russia and Azerbaijan. Recently, the Nobel family has taken the initiative to honor the memory of Ludvig. The Nobel Sustainability Trust was founded with the purpose of encouraging research and/or practice of sustainable and renewable energy, through an award. Not to be confused with the Nobel prize of Alfred Nobel and will be given to worthy individuals or organizations that during the year have carried out significant accomplishments in the field of renewable/sustainable energy (http://nobelsustainability.org/history/). However, there are other wider initiatives to realize the importance of UN-SDG as they involve coupling many other sectors and disciplines in particular those related to Water – Energy – Natural Resources Nexuses. Still water, sanitation and hygiene in developing countries are taken much smaller proportion in relation to the R&D done within energy-related sectors and disciplines. In this context, additional steps are being taken by the United Planet Faith and Science Initiative by launching a website that attempts to win a Nobel Peace Prize for Sustainable Development (NP4SD.org) with a shared nomination of an organization and two individuals. As explained by “NP4SD.org” it is not a new Nobel Prize, it is a Peace Prize to be shared by nominees whose work is foundational and seminal in the field of sustainable development (http://www.upfsi.org/). Among cases in the past where sustainability issues were taken in consideration is 2004-Peace Prize (http://www.nobelprize.org/nobel_prizes/peace/laureates/2004/press.html). Among other strategic efforts to support UN-SDGs, is to give Ecological Economics greater worldwide exposure and to create more widespread understanding of other strategic fields of importance for our well-being, survival and life-quality on planet earth and its growing population (http://www.isecoeco.org/nobel-peace-prize-for-sustainable-development/). Yet, much more is still needed to be done to promote and implement better policies for education, R&D and Transfer-of-Knowledge in the developing countries. If the Nobel Prize is used as indicator for these strategic activities it is very easy to conclude that the major parts of planet earth suffer from huge knowledge poverty. Then we can simply ask how the UN-SDGs be effectively implemented to achieve global sustainable socio-economic developments? Would the UN-SDGs be only a day-night dream for generations to come? This said, the traditional Nobel Prize has on large-scale and long-term perspective an long-standing importance, directly or indirectly, on improving our overall understanding of planet Earth and to some extent the fundamentals of improving life quality on the Earth’s surface. Building on science pyramid on large-scale and long-term perspective is strategic in pushing forward the wheels of technology and development. However, developments in science and technology in the past century along with the weak coupling with global sociey sectors through ineffective policy-making and lack of global coordination have caused the ongoing degradation in life quality on Earth. These negative trends could have be avoided or even limited if the UN-SDGs were realized and founded much earlier. More information on the traditional Nobel Prize awards for 2016, please see (https://www.nobelprize.org/nobel_prizes/medicine/laureates/2016/press-sv.html). “Sustain-Earth.Com” is inviting you to visit the given link for free PDF downloading of an award-winning e-book (The Sustainable Business) about sustainability and the circular economy. Free copies of the book are distributed for the purpose of explaining the fundamentals of waste elimination and resource-life extension (two core components of sustainability) and to facilitate sustainable business development and job creation. Currently, the book is used as an introductory course text (in business schools), as a basic training manual in businesses, and as a beginner’s guide for educating the general public. You are welcome to use it to do the same. EFMD is Europe’s premier academic-quality assessment organization; it accredits the world’s leading business schools. Just click on the book cover photo of the language you want. Again, you are welcome to share all the EFMD/CIPS sustainability portfolio materials (including the short videos) with your colleagues and networks – that’s what they are for! There reasons why the Earth’s system, as it is, is evolving in such a way that life quality is gradually degraded with emergence of new large-scale and long-term irreversible threats, e.g. global warming, decline of natural resources, collapse in bio-divesity and accelerating degradation in life quality. However, understanding the base-line conditions and requirements for the appropriate functioning and metabolism of the Earth’s system calls for instruments and tools to define the Earth system as it should be. This is essential and imperative at least for the survival of life on earth and to bring about sustainable socio-economic developments around the world. Earth system science (ESS) is the application of system’s science to the Earth’s system. In particular, the interactions between the Earth’s “spheres”—atmosphere, hydrosphere, cryosphere, geosphere, pedosphere, biosphere, and, also, the magnetosphere – as well as the impact of humans on these components. At its broadest scale, Earth system science brings together researchers across both the natural and social sciences, from diverse fields including ecology, economics, geology, glaciology, meteorology, oceanography, paleontology, sociology, and space science. 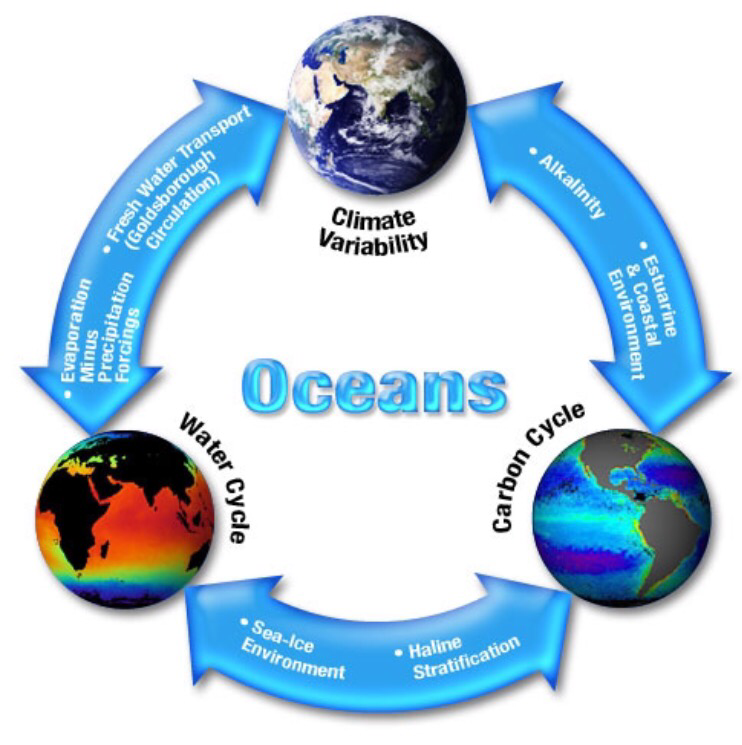 Like the broader subject of system’s science, Earth system science assumes a holistic view of the dynamic interaction between the Earth’s spheres and their many constituent subsystems, the resulting organization and time evolution of these systems, and their stability or instability. The Science Education Resource Center, Carleton College, offers the following description: “Earth system science embraces chemistry, physics, biology, mathematics and applied sciences in transcending disciplinary boundaries to treat the Earth as an integrated system. In this context, we can achieve a deeper understanding of the physical, chemical, biological and human interactions that determine the past, current and future states of the Earth. Earth system science provides a physical basis for understanding the world in which we live and upon which humankind seeks to achieve sustainability. Poverty is not new and has been with us for centuries and even for millenniums and there are several reasons for poverty (http://www.poverties.org/blog/causes-of-poverty). What we know from history is that there was no poverty, i.e. as we know it today, in Ancient Egypt (http://www.reshafim.org.il/ad/egypt/economy/). However, the vast majority of the population, probably 90% during the first two millennia of Egypt’s history, lived on the land in mostly self sufficient village communities and in a state close to serfdom.In practice a virtual ownership evolved when land could be freely bought and sold. Apart from the tenant peasants, a large section of the population worked as farm labourers. Administrators, priests, traders and craftsmen lived mostly in the cities along the Nile, which could be supplied with victuals relatively easily and cheaply by boat. From ancient Egypt, and other similar civilizations, modern poverty started somewhere at sometime and grown to the extent that it became an enormous problem and huge shame for humanity. In this process slaves became the route and even an official high-way to poverty. During this poverty became much rooted in many countries around the world, still it remain rooted and even expanding in many others countries (http://earthitude.com/top-9-problems-our-world-is-facing/). In this context, it must be a distinction between slavery and poverty, though both are not acceptable in modern democracies. One can be slave but not poor and one can be poor but not slave, however one can be both poor and slave. Poor can very easily be slaved for any purpose and once are slaved they can not decide, and even allowed to do so, and the only option for then is to carry out orders and even accept severe humiliation. This is even the case anywhere but in different forms and various levels. Global poverty started as poor people were first exported as slaves out from where they are living, in particular out of Africa by the rich and through the rich as slaves with no economic rights. Later on, there were left in the hands of colonization and capital where they were used as slaves and servants (also with no economic rights) but this time, also, in their own home countries. After self-independence that became slaves for whatever they were paid for, i.e. the economic rights are totally in the hands of the owners and capital-investors. Now to be free from, or to get rid of poverty is not a simple task at all for both sides, i.e. for the poor who needs the money and for the rich who need to keep their business running. This is just to put facts flat and in this case there are no simple or patented solutions. Another huge source of modern slavery and poverty are wars, civil wars , and political conflicts, where whole groups, communities, populations and families are threatened and forced by the gun out of there homes. Typical examples exist in e.g. Africa the MENA regions, and still a continuous source of global insecurity and instability. Even the UN “United Nations” and the WB “World Bank” are seeking data and information “know-about” from people around the world to know what to be done, where and how. A possible solution is using “Reverse Engineering, RE” to slowly propagate knowledge, know-how and resources among communities of different populations. Here are some information on RE (http://definitelyfilipino.com/blog/reverse-engineering-a-way-out-of-poverty/; http://sbj.net/Content/ENEWS-ARTICLES/ENEWS-ARTICLES/Article/Work-to-reverse-engineer-poverty-underway-via-Northwest-Project/29/82/103878). If you know of anymore or your have your own RE-poverty solution get it posted here. We create, compile and have more wider discussion on the issue. But what is Reverse Engineering “RE”. Reverse engineering, also called back engineering, is the processes of extracting knowledge or design information from anything man-made and re-producing it or re-producing anything based on the extracted information. By understanding the history, processes and dynamics of poverty evolution, it would be possible to reverse the process and make the poor more and more less poor and thereby achieving reasonable levels of equality of the benefit of everyone, i.e. it is a matter of sharing benefits (https://www.fastcoexist.com/3043531/how-the-sharing-economy-could-help-the-poorest-among-us). The process often involves disassembling something (a mechanical device, electronic component, computer program, or biological, chemical, organic matter or even socio-economic structures) and analyzing its components and workings in detail. The reasons and goals for obtaining such information vary widely from everyday or socially beneficial actions depending upon the situation. Any group preparing for a difficult mission such as climbing towards high tops against strong winds and steep heights, e.g. the Himalaya tops, knows that such mission is not free from an enormous number of excepted and unexpected risks. Accounting for such risks and taking all necessary measures and precautions is imperative not only for surviving, a long journey of such dimension, but also for fulfilling the goals of the mission. No one, whatsoever, can take such risks without careful planning and practise as well as having the necessary qualities and resources to withstand the all possible “known” and impossible “unknown” situations that can lead to failure. It is a matter of life or death and a journey where the very survival from the start to the end is a life mission, even after the mission itself is completed. The mission can, also be, understood and experienced as an instrument to learn and gain more merits “added-value” to cope with other future difficulties beyond the mission itself. It is from the “knowns” we can uncover, solve and cope with many other “unknowns”. If we have to continue our survival on planet Earth, improve whatever can be improved and sustain the quality of life in the near future of coming generations we need to think the same way. Thinking about 2050-2100 we will be struggling to solve serious problems “peaks” facing us on planet Earth. The future in this context requires convergence of our efforts and not divergence, i.e. to see the threats as common obstacles facing the life on earth and its quality. “sustain-earth.com” is an instrument for transformation of all the threats to challenges and to find solutions and implementations of what, why and how. It is about sustainability (https://en.m.wikipedia.org/wiki/Sustainability).